The spirituality of the dying process is the focus of Their Last Painting. It is an experiential book and will spiritually support the terminally ill, caregivers, baby boomers with aging parents, health care providers, bereaved loved ones and anyone searching for the meaning in life of death. Each chapter is a story, that depicts an ethereal painting, of psychic phenomenon, synchronicity, altered states of consciousness and/or the paranormal. The introduction starts with early childhood aspirations of being an artist; to the author's spiritual understanding of the dying process. The author plants the seed of sensitivity, compassion and creativity at an early age. It blossoms, when she's a young adult, to the understanding of the inner makings of a true artist. Later in life, Jean goes into her spiritual awakening, after caring for her mother, which takes her to the path that leads to Hospice, working with the terminally ill. Bringing the two paths together sets the stage for the book. The main characters in the book come from all walks of life, as their ages, ethnic backgrounds, gender and race, vary. 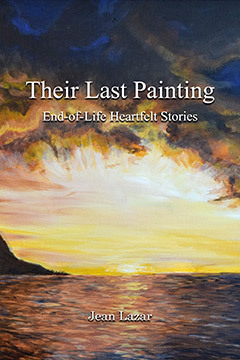 Their stories illustrate to the living what death and dying can teach. Jean Lazar is an author, artist/painter, teacher, spiritual minister, energy healer, Reiki practitioner, massage therapist, intuitional empath, and complimentary therapist. She graduated from CCMT in 2005 where she studied Massage Therapy; adding to her other independent studies such as Reiki, Therapeutic Touch and energy medicine. Jean has been working as a complimentary therapist doing massage therapy and Reiki for Hospice Care, and was recently honored for twenty years of service. Jean's latest book is a work of fiction and is called The Spa Conspiracy. It is available in print and e-book editions. She presently lives in New England, where she writes and paints in her studio, while working with her Hospice patients.